Looking for a unit exam that incorporates vocabulary, supply and demand shifting examples, and critical thinking? 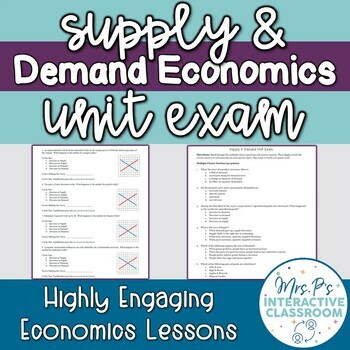 This Supply & Demand unit test contains 25 multiple choice questions and 9 free response questions (several have multiple parts to them) including scenarios students must solve to determine the affect on supply or demand- and the new resulting equilibrium. There is a detailed review packet that includes vocabulary review and sample problems in the same format as the exam. The exam is available in PDF form and Word form so that you can pull the questions that apply to your class if you so choose. All questions are perfectly aligned with my Supply & Demand Unit Bundle (including Shark Tank Project and unit exam!) and is included in that bundle. Price Controls Lesson & Minimum Wage Debate!